Axial Expansion Joint is the simplest assembly in family of expansion joint. It consists of a bellow element with end connections. It is used for axial movement only in pipe configurations. However, it can also absorb small amounts of other two types of basic movements viz. lateral and angular. 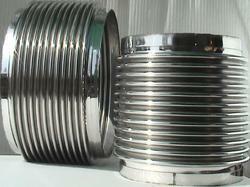 We put forth a well-tested range of Single Axial Bellow that is designed using finest quality material. This range is available in standard as well as customized dimensions in order to suit the variegated requirements of our valued patrons. It is corrosion resistant, abrasion resistant and serves for a prolonged period of time. We are offering Shipping Bellows.